Frost tinges a young balsam fir growing in Franklin. 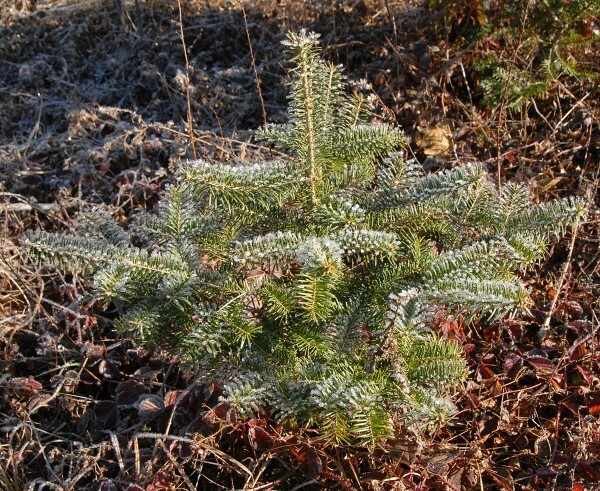 Balsam fir, like trees native to Maine, are excellent candidates for planting in a yard as part of a natural landscape; already adapted to the state’s frigid winters and tough growing conditions, native trees can thrive where imported species struggle to survive. There seems to be no end in sight for the natural landscaping trend, which has numerous benefits to homeowners, including less time and monetary investments. Natural landscaping is usually synonymous with sustainability because it incorporates the use of native plants that are indigenous to the geographic area being landscaped. Native plants have evolved and adapted to local conditions over thousands of years, provide habitat to native animals, and are the foundation of ecosystems. The use of these plants require almost no soil amendments, irrigation, pesticides, or herbicides because they have acclimated to the local climate, soil conditions, various pests, and herbivores. Native plants create low-maintenance gardens because they usually can tolerate their region’s heat during summer and cold during winter, growing and thriving without much, if any, maintenance. But how can you incorporate these native plants into your landscape? Simple: Instead of buying that new hot pink plant your local nursery just got in, ask what type of native plants the nursery carries. Or perhaps you’re just starting your garden. If that’s the case, a solid plan is key. Decide how you want your yard to look and that features that you would like to incorporate, such as a patio for entertaining or a play area for kids. Begin by sketching out the ideas. A great way to get inspired is by walking around in nature. Notice how plants naturally grow together and take these ideas back to implement in your landscape design. One of the secrets to a successful landscape is plant selection. It is important to know what type you will need — low-growing, medium, or tall — and how many. Not truly thinking a plan through is a common problem. People just choose plants they like without considering how big they will grow to be. Doing research is extremely beneficial. The University of Maine Cooperative Extension is an exceptional resource, and its website has lists of plant species native to Maine, in addition to other helpful information, at umaine.edu/gardening/home-gardening/plants-for-the-maine-landscape/. Another important tip: Do not forget the trees! Often people have the tendency to shy away from planting trees near their houses and incorporating them into their design plans. Trees are extremely valuable to a landscape: They help keep a house cooler in the hot summer months, absorb air pollution, and help manage water quality. When trying to select a perfect tree, keep in mind that it will grow; it won’t always stay the size you got it at from the nursery. Look for a tree that at its mature size it will provide enough shade without becoming overwhelming or dangerous. If it is going to be planted near utility lines make sure it is less than 30 feet tall. Some trees have wide-reaching roots; these roots can damage your foundation and other hardscaping elements in your yard. Stay away from trees that require lots of pruning or shaping. In the end, if you keep it simple, go native, and buy local, you will be able to create scenic natural landscapes. And take your time; there’s no rush. Your design does not need to be executed in one season. Remember, the natural landscaping trend does not seem to be wilting anytime soon, like those exotic imported flowers may tend to do. David Ffrench is with University of Maine Environmental Horticulture.